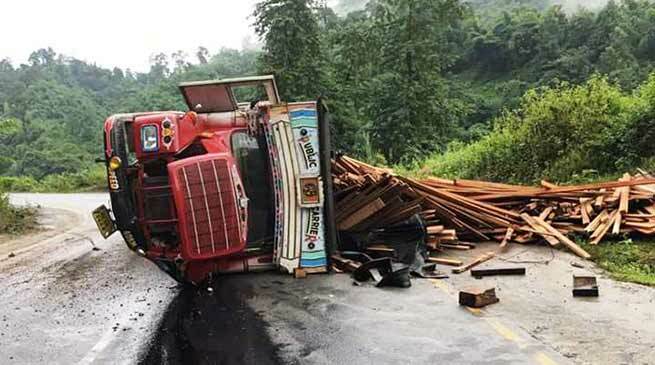 A Truck loaded with finished timber meet with an accident near Sopo-Jampa area of Doimukh Circle today morning reportedly carrying the materials from Sagalee towards Capital Complex on Trans National Highway. There have been no report of casualty. An another accident reported on National Highway (four lane road) in Nogoan district (Assam) today morning wherein the Arunachal Pradesh Government vehicle of Department of Power, The Scorpio bearing registration No AR 01F 0243 vehicle was attached with the Sagalee division Executive Engineer Tajon Taggu. After dropping the parents of the Executive Engineer for medical treatment at Guwahati and was coming back and the accident occurred wherein the son of the officer and driver who were in the vehicle received serious injuries.